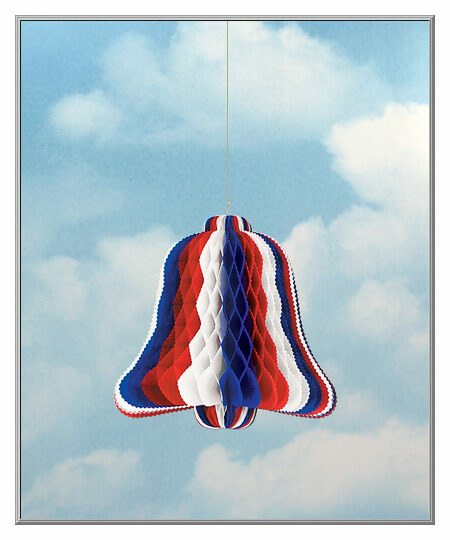 10" high ~ Made in the U.S.A.
Let freedom ring with this tissue bell! A festive way to display the red, white and blue, the hanging party decoration is made of honeycombed tissue paper. The bell arrives flat and folds open into a three-dimensional decoration. This top-quality tissue bell is manufactured in the U.S.A. by a party goods firm that was founded in Pennsylvania in 1900. Sold as one tissue bell. Patriotic tissue bell is 10" high. Patriotic Tissue Bell ~ 10"